One of the best things we can do to create a healthy home is to simplify the way we clean. It’s shocking what goes into everyday household cleaners! The EWG found that 53% of products they tested contained ingredients that cause lung damage and even known carcinogens. Which means that when you use it on your countertops and wipe it with your sponges and clean your dishes – those chemicals don’t go anywhere. They persist. Studies found that the air quality in our own home can be up to 70% more toxic that outdoor air, even in urban cities! That’s because our homes are essentially sealed containers, and if we use chemical cleaners inside – these toxins have no where to go. I think it’s become overly complicated for everyday life to worry about what’s in these chemical products, but we don’t need to use them – it can be much simpler. One of my favorite cleaning products has only two ingredients and it does an amazing job. The best part is that you can use it safely and confidently in your kitchen, on the very countertops that you serve food on! Let me show you what we’re making! This kitchen scrub cleanser is a healthier version of kitchen powder cleansers sold in stores. We simply sprinkle it on and scrub clean. It’s incredibly effective and very simple to make. The gritty texture gives our surfaces a good cleaning, yet it’s gentle enough so it won’t scratch. It’s great for cleaning the bottoms of pots and pans, but we can use it all over the house – to scrub the fridge, oven, bathtubs, sinks and countertops. A good idea is to sprinkle the baking soda over your surfaces, and let it sit for a few minutes so that it can absorb bad odors before you wipe it clean. Gives our homemade cleaning products a boost of benefits. Depending on the oils that we choose – we can create a cleaner that disinfects, kills mold, degreases or repels insects. It’s so amazing to create exactly what you need. We also get aromatherapy while we’re cleaning! You can choose oils that make you feel calm, energetic or put you in a good mood. For this recipe, we’re using Orange Essential Oil. It helps to break up grease, great for the kitchens – but also the aroma is bright and makes you feel good. Step 1: Find a container for your kitchen scrub. This jar holds about two cups of baking soda, which will last all month depending on how often you use it. I use about a tablespoon sprinkled in my kitchen sink everyday. I love it! And when it finishes we can always make a different blend – maybe lavender next time or a festive seasonal blend… It’s fun to get creative. Step 2: Choose your essential oil. For this recipe, we’re using orange essential oil. 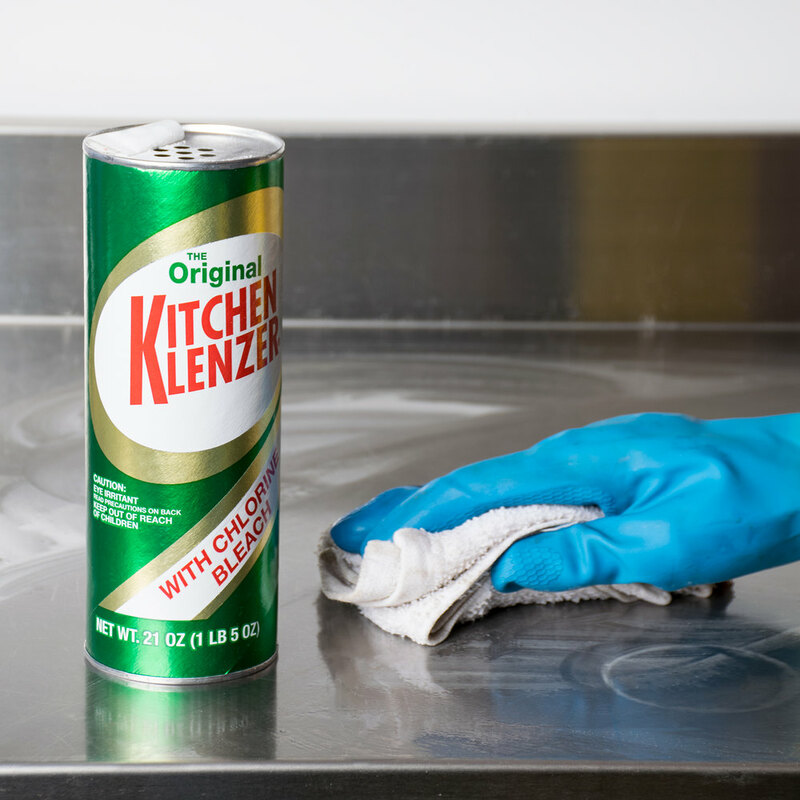 It’s really good at breaking down grease – really helpful for cleaning ovens! Oven cleaners are one of the most toxic products out there – so this simple swap will helps create a healthy home! This smells amazing! The baking soda hold the scent really well, so we’ll breathe it in every time we open this jar! Step 5: Seal it tight. It’s a good idea to label this so you don’t end up baking with it and making orange flavoured muffins, although that doesn’t sound terrible at all – unless it’s not what you wanted! I always keep this jar under the sink with my other cleaning supplies so it’s at hand whenever I need it. Which is every day. One of the most amazing benefits of baking soda is it’s ability to deodorizes. It gets in the sink, down the drain and keeps everything smelling clean and fresh. Sprinkle Orange Scented Kitchen Scrub all over your kitchen sink and let it sit for a minute so that it can soak up all the cooking smells from dinner… and then simply wet your normal sponge that you use – scrub and clean. Rinse the sponge under the faucet and continue wiping until every last bit has dissolved and been wiped away. You’re left with a sparkling clean, beautiful smelling sink – ready for another day! I hope you liked this idea. Give it a try and use it tonight. Let me know in the comments what’s your favorite way to clean with baking soda? I also like using baking powder instead of pure baking soda because baking powder turns fizzy when it comes into contact with moisture and that gives me the good old “foamy” feeling when cleaning :) .